Man pulled from burning car thanks Good Samaritans, Chauncy Glover reports. PEARLAND, TX (KTRK) -- After his car veered off the road Sunday morning in Pearland, Paul Davis Jr. is thankful to be alive. Davis Jr. was rescued by strangers just seconds before his car burst into flames. "To the grace of God, I am all right as long as I don't move," he said. Although in a hospital bed and not able to move, Davis Jr. still has a smile and a joke to tell. "I said man, can you get my pickles out the car?" he said. Dramatic video captured four good Samaritans heroically rescuing a man trapped in a burning car Sunday in Pearland. It was Nick Villanova and other good Samaritans who worked to get Davis Jr. out of the car. Villanova used a wooden club to break through the window, but at first, couldn't find anyone inside. "I was sticking my hands out and I told him I was stuck and he yanked me on out of there," Davis Jr. said. 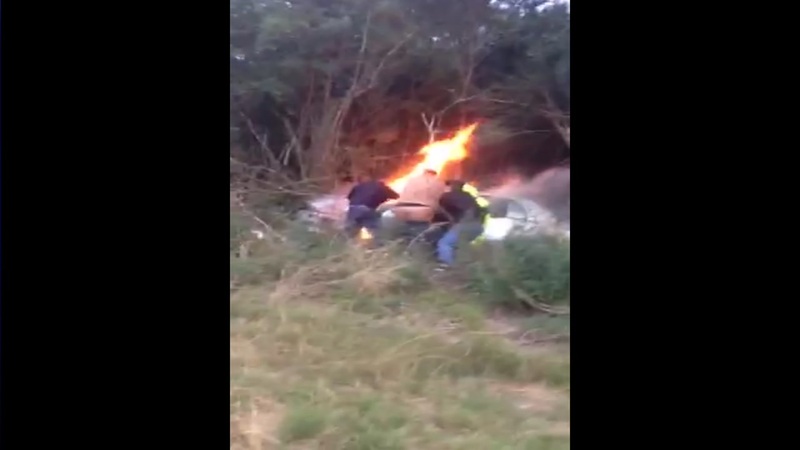 One of the videos showing a person being pulled from a burning car in Pearland. Doctors said it is going to take 12 weeks for him to recover. He called the good Samaritans his Christmas angels. "Thank you, thank you very much because if wasn't for you I wouldn't be here today, thanks a lot," Davis Jr. said. "If you wasn't there I would've been burned up."